Over half a million people visit the idyllic Fiji islands each year on holidays. For many residents of Fiji however, life in Fiji is no holiday. Many families earn little more than a few dollars a day and must grow their own food in order to survive. Home is a lean-to structure without power or water, and even the basics of life are often out of reach. At Fiji Kids, we believe that all Fiji’s young people deserve the opportunity to realise their potential and live their very best lives. Our aim is to break the poverty cycle in Fiji through education. 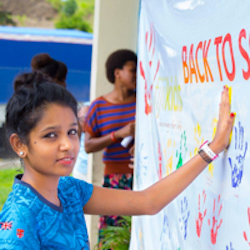 Public education in Fiji is fee-free but parents face considerable costs if they want their children to participate in school life. Uniforms are mandatory, and kids need shoes, books, stationery and school bags. Sporty students sit on the sidelines if they cannot afford sports uniforms and gear. Costs mount up to hundreds of dollars a year – money that many families simply do not have. 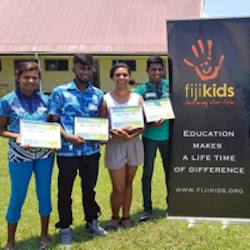 Fiji Kids is a volunteer based, grass roots charity. We have operated in the Sigatoka (Coral Coast) district in Fiji for over 10 years. Funded by our generous sponsors we have supported almost 150 students to attend school. Through our Tertiary Scholarship program 10 have gone on to attain qualifications from trade certificates to degrees and now have paid employment in meaningful jobs. 10 more of our graduates are currently funded to attend university or vocational college. We have helped these young people become nurses, teachers, chefs, carpenters and accountants. We could not be prouder of their achievements! Fiji Kids is also there when young people and families hit hard times. We provide emergency food aid in natural disasters and have airlifted four children overseas for emergency medical treatment that was not available in Fiji. With your support we can continue to offer education, opportunities and a better future to Fiji’s most disadvantaged kids. We're working on updating our website to better help serve the needs of our Fiji Kids. In the mean time, please make sure you follow us on Facebook. You'll be able to see the wonderful impact you and others are making towards the lives and futures of many Fiji Kids. Thanks to our generous sponsors, we currently support 75 children to attend primary or secondary school. Learning for Life refers to our commitment to support the student in need for the full duration of their school years in the hope that they complete their secondary school studies. We provide "Back to School" packs providing young people with all the essentials to participate in a busy year of learning. We enjoy seeing the bright eyes and happy faces as the kids realise they have everything they need. We currently offer 12 scholarship places and have students studying Teaching, Agriculture, IT, cookery and customs security. 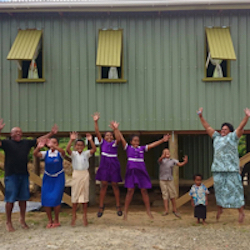 Fiji Kids are now qualified and working as nurses, accountants, carpenters and teachers. We could not be prouder! 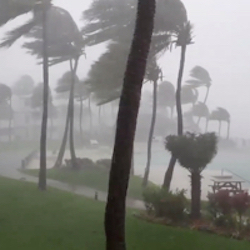 Fiji is a hot spot for cyclones, and many of our families live in low lying areas and on the banks of rivers – areas that are particularly susceptible to floods. 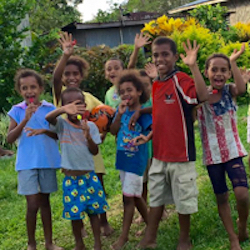 In these most trying of circumstances Fiji Kids helps families get back on their feet and kids back to school with food and emergency supplies. 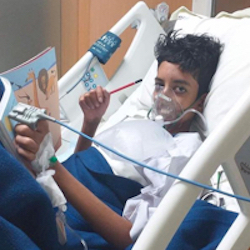 Fiji Kids is not a medical aid charity but when faced with a very poor family and a child in need of life-saving surgery we ask "if not us, then who?". We have organised fundraising appeals and coordinated the emergency airlift of 4 children for medical treatment only available outside Fiji. We also provide financial support for Fiji Kids who need basic medical or dental care. We have worked with other agencies and NGOs such as Habitat for Humanity and Loloma Home to find housing solutions for families with nowhere to go. Without a stable home young people are not able to focus on their education. Your donation, whether one off or monthly allow us to fund our important work, keep Fiji Kids operational and reach more children in need. A monthly donation of AUD$33 (FJ$50) provides school requirements for one primary or secondary school student. With 75 students in our program we have reached our maximum capacity with available resources. Yet there are so many that live in heart-breaking poverty and are not able to participate in school life. We need two additional part-time support staff in order to expand our program to reach them. We need a vehicle to access the remote areas where these young people live. Your donation to our sponsorship program will allow us to increase the number of kids we can assist and lives we can change. Our Tertiary Sponsors contribute AUD$33 (FJ$50) per month to fund further education scholarships for Fiji Kids high school graduates. We are excited to have a few high performing students needing sponsorship now. To help change the future of a Fijian teenager, download and email the below form to sponsoring@fijikids.org. Give the gift of education for your next wedding, birthday or Christmas present. Our personalised gift certificates allow you and your recipient to be recognised for helping Fiji Kids achieve its mission. Not all help has to cost money. Sharing the story of Fiji Kids is just a valuable. Your contribution will be in every donation we receive from your advocacy. Simply follow us on Facebook and share the love with your friends and family. Fiji Kids! Learning for Life is a grassroots charity providing financial assistance to help the neediest children attend school.